We have discussed “First law of thermodynamics” and “second law of thermodynamics” in our previous post, where we have also seen the limitations of first law of thermodynamics. Today we will try to understand here the Zeroth law of thermodynamics. “If two systems are in thermal equilibrium separately with a third system, then they will also be in thermal equilibrium with each other”. 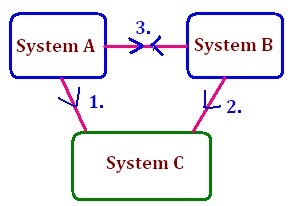 Let us consider we have system A, system B and System C as shown in following figure. If system A is in thermal equilibrium with system C and system B is also in thermal equilibrium with system C. Then according to Zeroth law of thermodynamics, system A and system B will also be in thermal equilibrium with each other. Let temperature of system A is TA, temperature of system B is TB and temperature of system C is TC. Then according to Zeroth law of thermodynamics, temperature of system A will be equal with temperature of system B.
Zeroth law of thermodynamics provides the basic of temperature measurement. If two systems are brought in contact with each other, how we will come to know the direction of heat transfer? We can only predict the direction of flow of heat, if we are having information of temperature of both systems. Temperature of systems will tell us the difference between hot body and cold body. Once we have information about the hot body and cold body, we can express the direction of heat flow between both bodies when they will come in contact with each other. Zeroth law of thermodynamics explains the basis of temperature measurement. With the help of this law, we can compare the temperature of system A and system B with the help of third system i.e. C without making thermal contact between system A and B. For securing quantitative measurement of temperature, one reference system will be used and simultaneously we will have to select few physical properties of this system that changes with respect to temperature and such properties will be termed as thermometric properties. Variation in thermometric properties will predict the variation in temperature. Reference system which is used here for determining the temperature will be termed as thermometer. System C will be termed, in zeroth law, as thermometer in above example. There are six various types of thermometer as mentioned here with their respective thermometric property. We will start our discussion with third law of thermodynamics in next post.